The project’s aim is to develop such a technique. 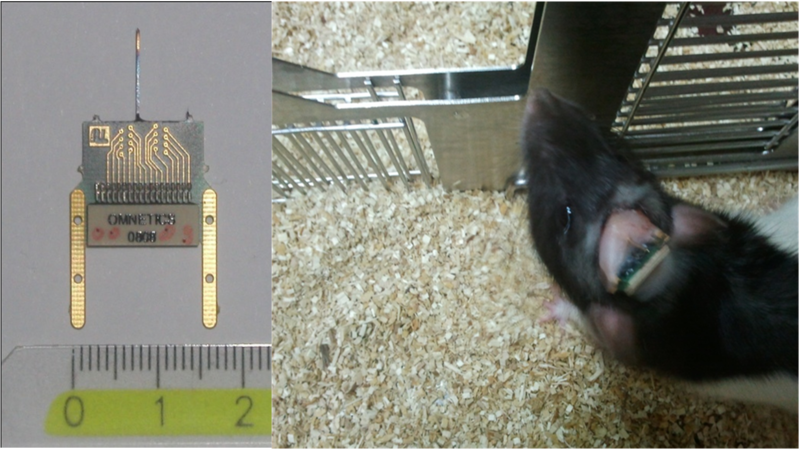 We intend to create an innovative interface between a semiconductor chip or an ensemble of semiconductor chips and the brain of a living rat. Small CMOS chips featuring stimulation and recording sites integrated at high-density (up to 1000 elements spaced down to below 10 micrometers) will be implanted in several brain areas, either independently or simultaneously, thus obtaining an unprecedented control of neuronal activity in the mammalian brain. Thanks to high-density integration, functional electrical imaging and stimulation of neuronal networks within the brain cortex and deep nuclei will be performed at a spatial resolution close to the single neuron and at a temporal resolution of a few tens of microseconds. Obtaining such high spatiotemporal resolution will enable to explore and control brain information processing with unprecedented detail. The project will focus on sensory-motor circuits regulating coordinated voluntary movement. By exploring interfacing with the main cortical and nuclear structures of the brain, the choice of this neurobiological context ensures that the approach will have a general applicability to several other brain circuits such as those underlying vision, hearing and attention. To begin with, the brain-chip interface will be implemented in the motor system which includes the motor cortex, the cerebellar cortex and the deep brain structures of the basal ganglia such as the striatum which is the largest deep structure in rats and the subthalamic nucleus which is essential for brain stimulation in alleviating Parkinsonism symptoms. The cerebral cortex is the most attractive and challenging brain structure, as it is involved in conscious and voluntary behaviours. It has a complex columnar organization in which thousands of neurons are widely interconnected. In turn, connectivity among columns extends the complexity of cortical wiring. Although cellular physiology has progressed amazingly in recent years, recording neuronal activity from multiple elements within such cortical columns remains a fundamental experimental challenge. The new technique will provide this opportunity, unrevealing the integrated neuronal activity within columns and complementing the attempts currently under way through in vivo imaging and mathematical modelling. Bi-directional interfacing will allow for the first time a powerful mean of communication with these modular cortical structures. The cerebellar cortex is the brain region where the most is known about neuronal network information processing and its neural circuitry exhibiting an exceptionally simple and modular geometry. It is therefore in this region that we will initially test and validate the brain-chip interface (Figure 1). Despite its simple organization, the cerebellar cortex plays a major role in complex brain functions, particularly for what concerns motor control, but probably also cognitive and emotional processing: it acts as a “co-processor” of the cerebral cortex capable of fast performance in complex computational tasks such as motor planning, execution and learning. These two features, (i) the simple and modular network organization and (ii) the capability of fast and complex computations, make the cerebellar cortex an excellent candidate for implementing a high spatiotemporal resolution brain-chip interface. The chips will be connected through leads that will reside permanently in the brain. We anticipate that wireless transmission approaches will subsequently be implemented because it will simplify connecting the chips to the monitoring system and will therefore interfere less with animals’ movements. Wireless connection as intended here is highly desirable not only for basic research applications but also for various neurological applications. Thus, the development of wireless systems will not (yet) be accomplished within this project. The analysis in vivo will be preceded and complemented by experiments in vitro using cultured tissue and acute brain slices. These will allow to carefully studying the properties of bi-directional interfacing between nervous tissue and the chip. The transfer of voltages and currents from chip-to-brain and brain-to-chip will be analysed in detail and integrated into a biophysical model of the nervous tissue-chip interface. Then, characterization and modelling will be carried out on the “in vivo” implant. The capabilities of the interface to record and stimulate different neuronal signals (single or multi-unit spikes and local field potentials) will be investigated and optimised by the use of signal processing algorithms and by the development of appropriate stimulation protocols, thus achieving a fine control of neuronal networks activity, including synaptic plasticity. CyberRat represents the basis for an extensive and innovative investigation of the central nervous system as well as for the development of human neuroprostheses and devices for the therapy of neurological disorders. These devices that are based on high-resolution bi-directional interfacing between semiconductor chips and the nervous tissue in the cortex and in the deep-brain will pave the way to tailoring stimuli that are suitably “locked” to the brain activity, thereby increasing treatment efficacy and reducing side effects caused by excessive stimulus intensities. Furthermore it is expected that the technological advancement achieved in this project will foster the development of innovative ICT brain-chip devices capable of new forms of computation, sensing, communication, physical actuation or adaptation. Throughout the project we will face bottlenecks: power dissipation induced heat generation of the chips will have to be minimized by careful design optimised for low power operation and by limiting the number of integrated elements with respect to the previous chip with 16000 sensor sites; wiring from chip to external electronics will have to rely on flexible interconnects whose number and diameter will be kept as small as possible by integration of active circuitry for multiplexing and other more sophisticated solutions; chips assembly will have to provide biocompatibility and mechanical-electrical stability, particularly for chronic implantation in the freely behaving rat; chip implantation (and chip design) will have to be optimised to match at best the 2D architecture of the array with the 3D architecture of the neuronal networks in the brain while limiting to the minimum tissue damage.